I broke my finger last week. I was helping out the Soldier, trying to be all “loving” and, as a result, I’m now crippled. Puffed Potato Pancakes were the last thing I made as a whole being. I remember it like it was yesterday. Now I’m here all gimpy, and whatnot; and I’m miserable, friend. Console me. We were tearing down an eyesore of a pergola and deck that we have in the backyard. In retrospect, it’s great we tore it down because it’s what actually caused my finger to break. Suffice it to say: had it stayed up, we’d have a lot more than a broken finger on our hands, *barrump-bum*. Anyway, a visit to the emergency room and a full hand splint, and I’m back to semi-not normal. I, truthfully, had no idea how ambidextrous I was until I couldn’t use my left hand. Here I am, just wasting away to a shell of who I once was…kind of. Okay…that’s a bit much. But, I am really annoyed. 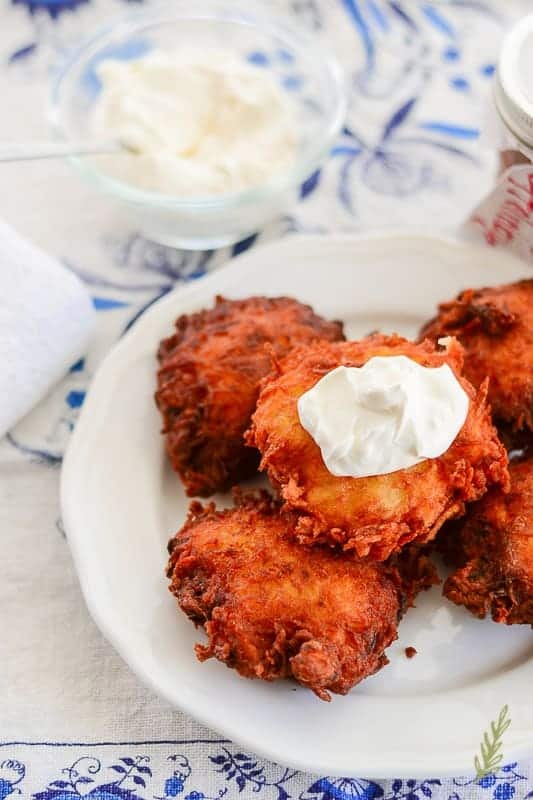 I was introduced to potato pancakes, or latkes, back in the early nineties. On a visit to NYC, I popped into a Jewish deli and ordered them. Mine were the “pimped out” version because they had capers, sour cream, pickled onions and lox piled on them. Needless to say, I was hooked. The great thing about my puffed version is the fluffy factor. I also add my sweet-tart Apple-Pear Butter to make things exciting. Is it sacrilege? I don’t know. I’m not a kosher chef, after all…heck, I’m not even Jewish. So, while I hope I’m not breaking any dietary rules, the taste of these beauts make me feel kind of okay if I am. These puffed potato pancakes call for two kind of potatoes: starchy russets and flavorful Yukon Golds. The latter is definitely packed with more water, whereas the former gives the puffed latke a good amount of bulk. Try your own blend of potatoes, but avoid reds as they’re too waxy. The first step in all latke recipes, is to grate (or shred) the potatoes. I shred my potatoes directly into a bowlful of water to cut out an added step. The water bath is necessary to clear away all of that extra starch in the potatoes. Excess starch will cause the fried latkes to become soggy, and that’s just waste of all of our time. Allow the potatoes to soak for at ten minutes- just enough time to prep the rest of the mix. This is where you’re going to hate me. I don’t like bland latkes. Because of that, I add grated onion to my puffed latkes. This is sheer torture, you guys. 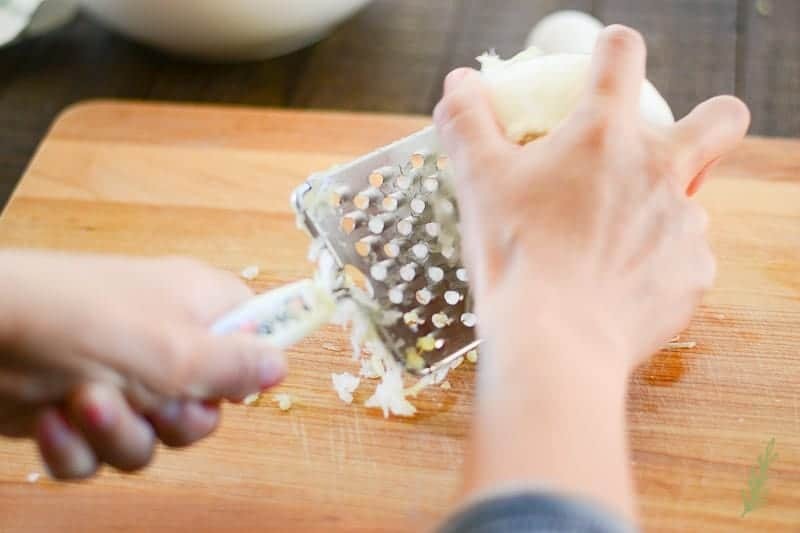 The noxious fumes emanating from the grated onion makes my broken finger feel like a spa day. But, grate we must. Sheer torture, I tell ya. Once you’ve stopped crying, drain your potatoes in a colander. Allow the potatoes to drain for 5, or 6 minutes. Press down on them a few times to encourage them in their dryness. You think your potatoes are dry? Well, I’ve got news for you. THEY’RE NOT! Don’t believe me? Try this. No, really, you have to do this next step- pour the potatoes into the center of a clean kitchen towel. Bring up the four corners of the towel and begin twisting. This is, obviously, something I couldn’t do now with my devastating injury. Twist, and twist, and twist until you reach muscle failure, or until the liquid has stopped flowing. Told ya’ they weren’t dry yet. 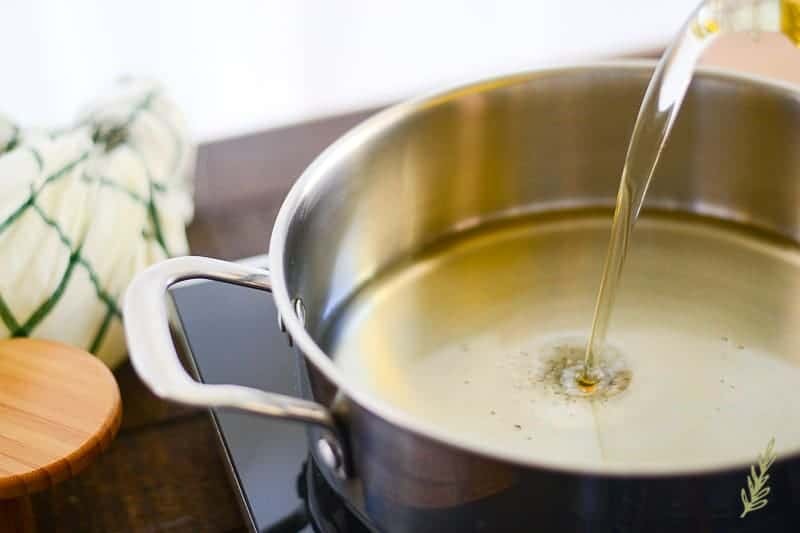 The reason why this step is so important is twofold: for starters, I’m sure you’re aware that the act of introducing water to hot oil is never a good idea. The second is that whole soggy latke deal. Don’t skip this step. Now, before continuing on, we need to get our oil on the stove so it can get hot. Vegetable, or peanut, oil is best because they both withstand high temperatures without burning. 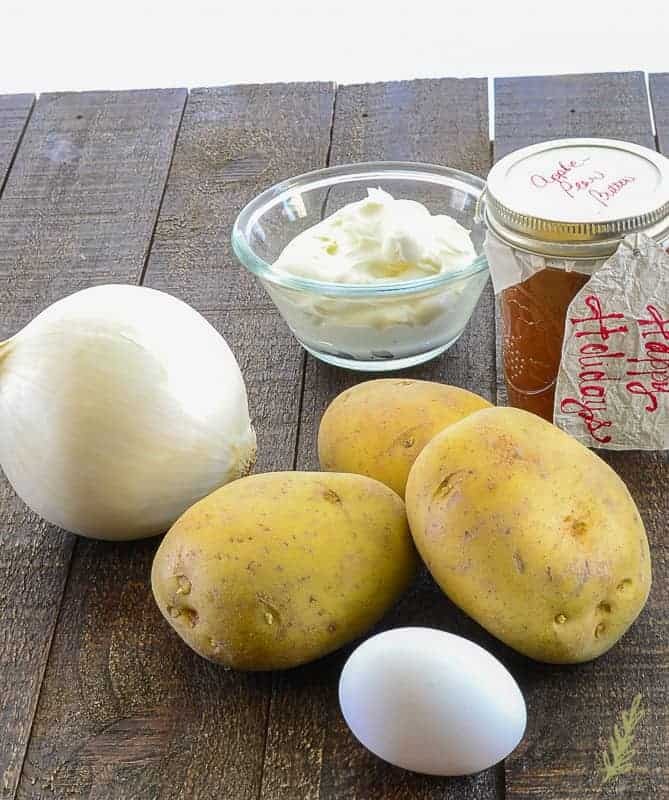 While the oil is heating, transfer the dry potatoes and the onions to a large mixing bowl. 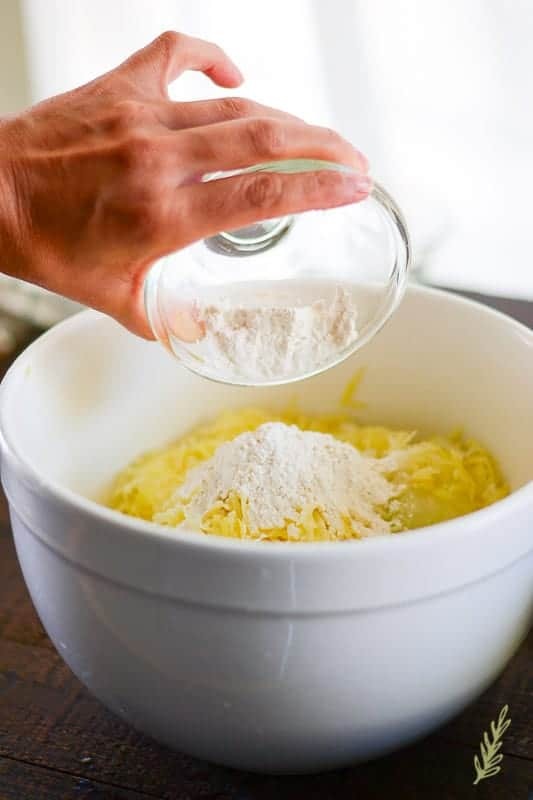 Add all-purpose flour to the potatoes. 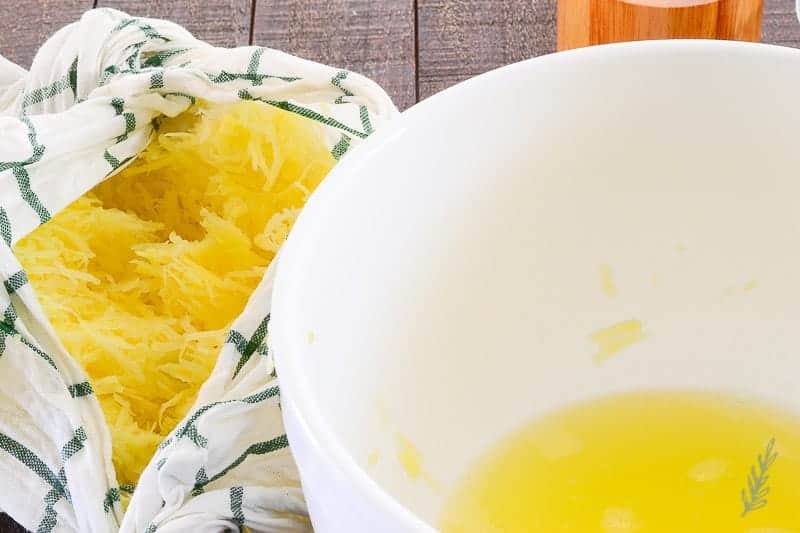 This ingredient helps to bind the puffed latke together. Now add baking powder and kosher salt. In times past, I’ve been known to get fancy and add a dash of nutmeg to my puffed latkes. I’d highly recommend trying it. Finally, add your beaten eggs. This is the final binder which holds our latkes together beautifully. Mix everything together completely. Once your mix is fully combined, your oil should be hot enough to fry in. 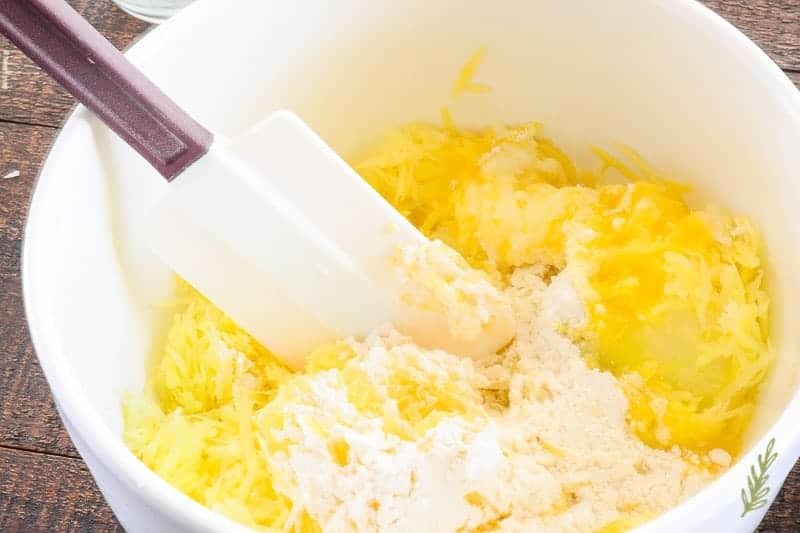 If you find there’s still a considerable amount of liquid in the bottom of the bowl (more than a couple of tbsps), drain it in the colander for an additional 15 minutes. You’ll have to remove your pan of oil from the heat while it drains, though. Just return the pan to the stove towards the end of the fifteen minutes to reheat the oil. If you have a deep-fat fryer thermometer your oil should read 350-375°F. Prepare a dish to drain your cooked latkes in once they come out of the oil by lining the dish with paper towels and setting it to the side the pan. Test out the temperature by dropping a small amount of the latke mixture into the hot oil. 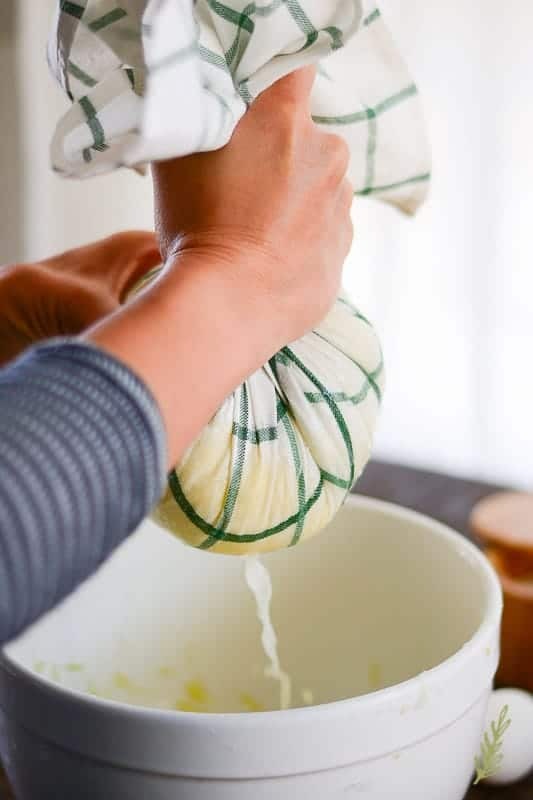 Small bubbles should form around the drop immediately, and the mixture should rise to the top quickly. If it browns instantaneously, the oil is too hot and you’ll need to reduce the heat a bit. 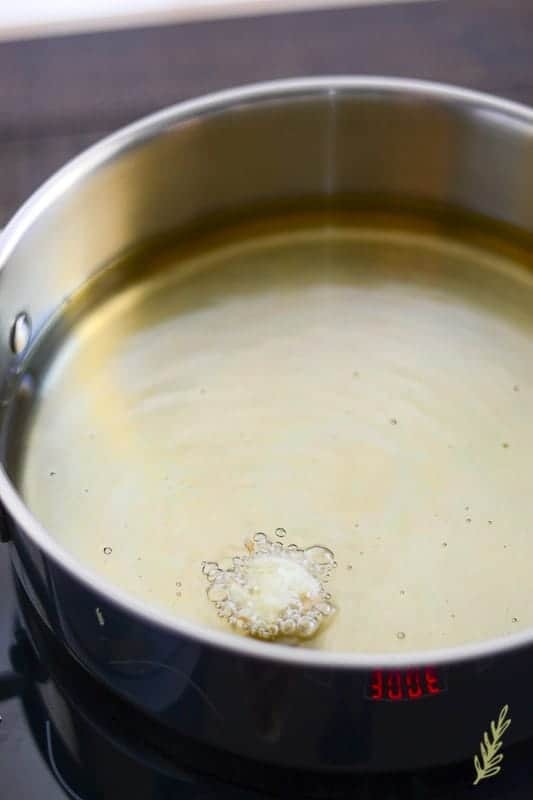 If it doesn’t form bubbles around the sides, the oil is not hot enough- wait a little while longer before proceeding. Once your oil is the correct temperature, scoop up a handful (or 1/4 cup) of the mixture. Carefully, drop it into the oil. Continue adding to the oil until you have three or four latkes in the pan. You don’t want to overcrowd the pan- this will cause the oil’s temperature to drop which will result in soggy latkes. 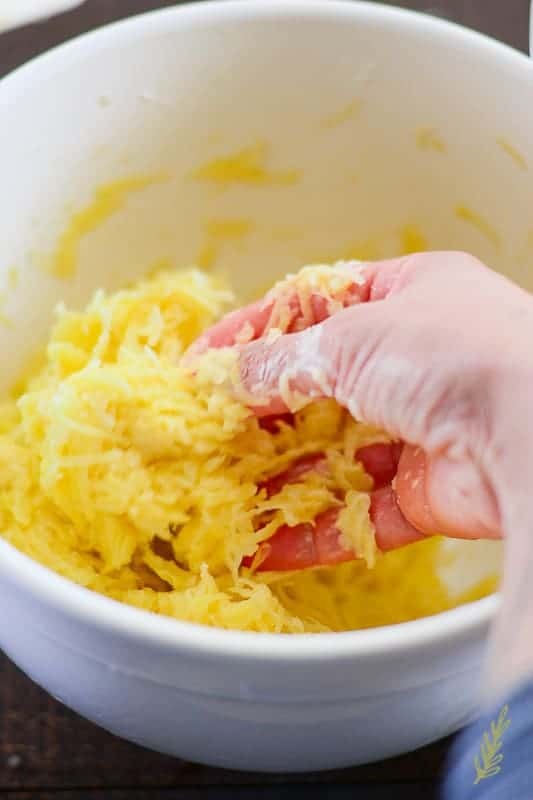 Fry the latkes for 3-4 minutes or until you see the sides taking on a golden color. If they’re browning too fast, reduce the heat slightly. 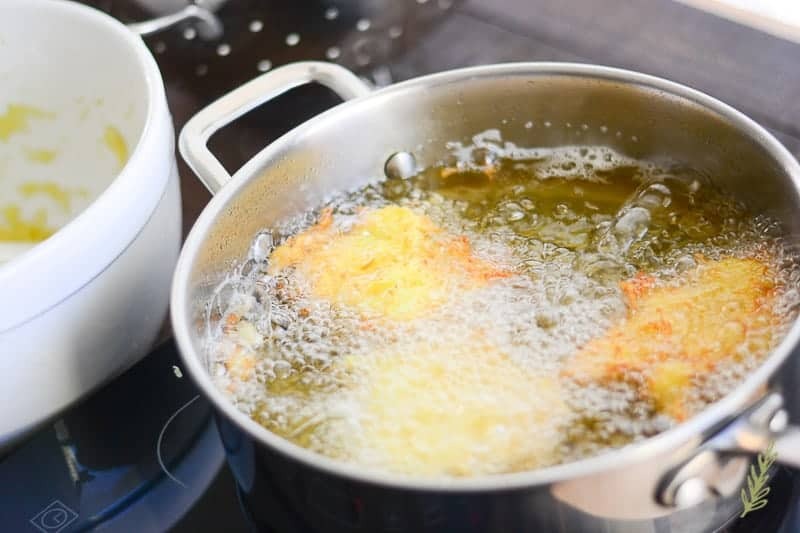 Flip your puffed latkes over and fry for an additional 4-5 minutes. 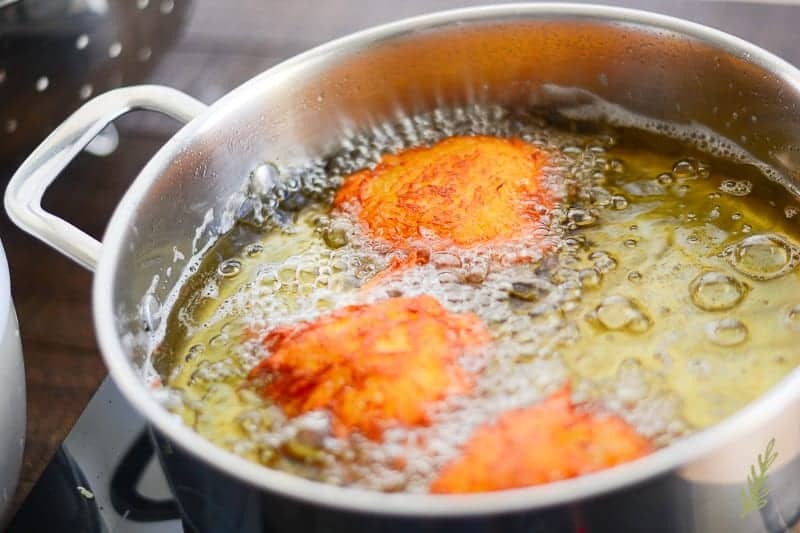 Use a slotted spoon, or a spider, to remove the latkes from the oil. 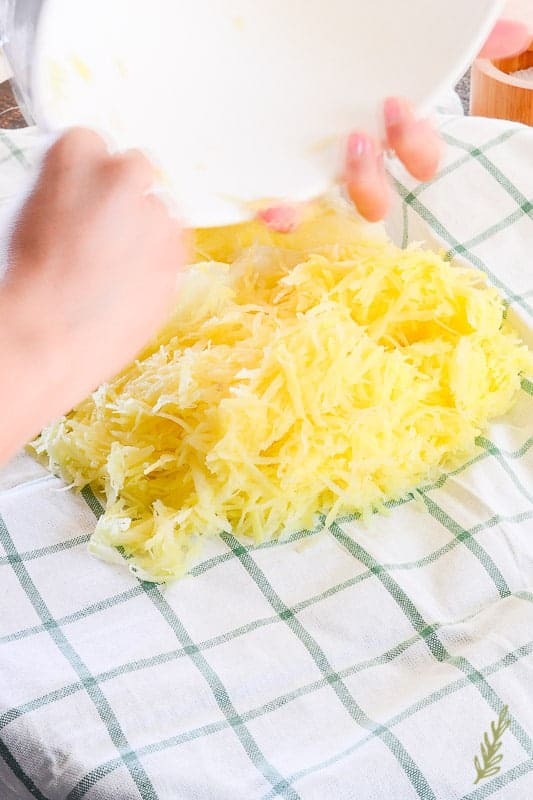 Place the cooked latkes into your paper-towel lined holding dish. Continue frying the remaining latke batter until they’re all cooked. However you top these puffed lovelies, you’re bound to love them- broken appendages, and all. 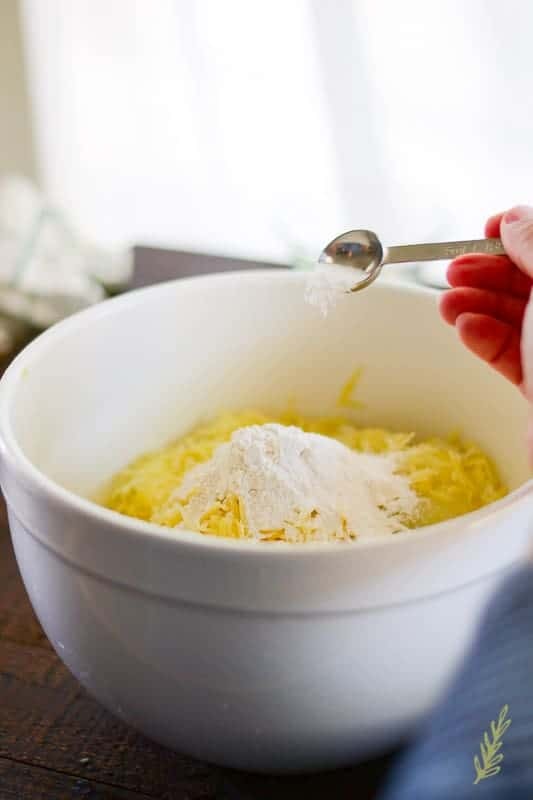 Try these quick-fix treats and pin the recipe to share with your friends and family. Customize these puffy treats with your choice of toppings. 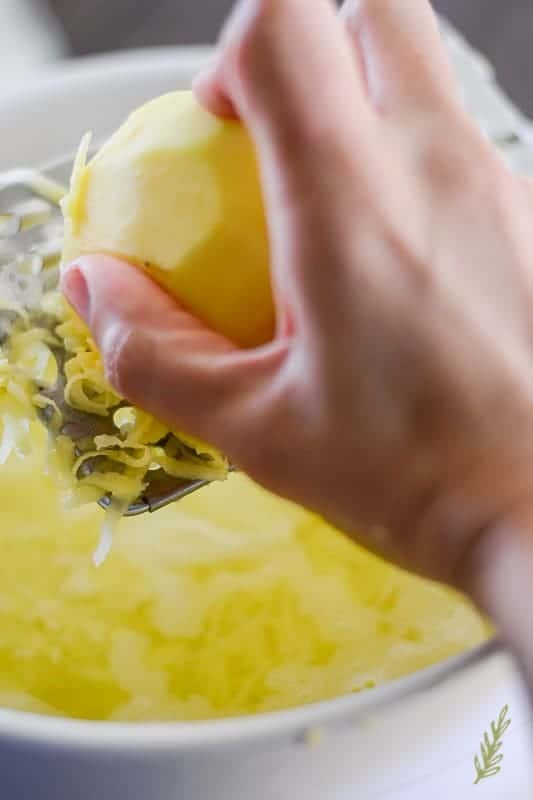 Soak your grated potatoes in a bowlful of cold water for 15 minutes. 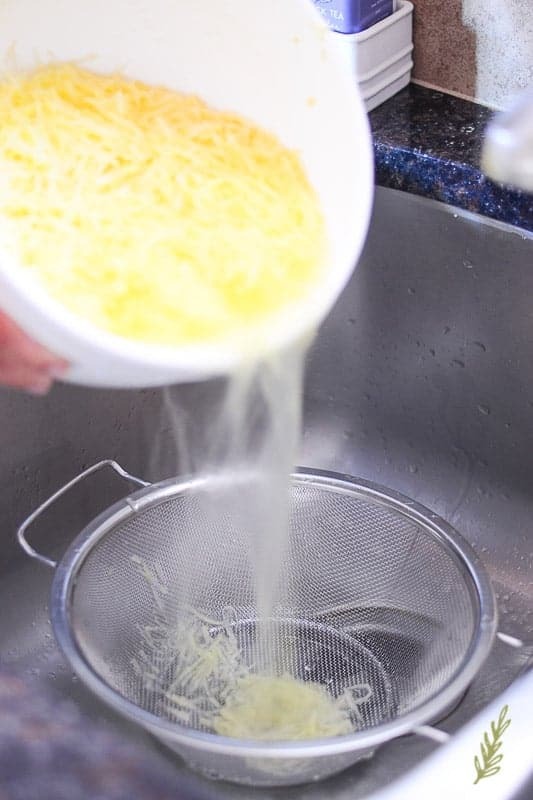 Drain in a colander, lightly squeezing to extract excess water. 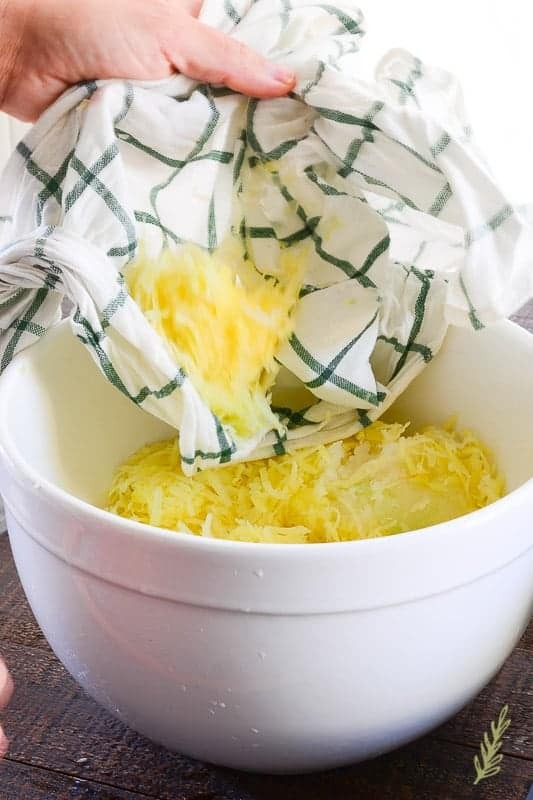 Transfer the potatoes to a clean kitchen towel. Wring out the potatoes by twisting the towel. Preheat 3 cups of vegetable oil in a 3qt skillet to 350-375°F. 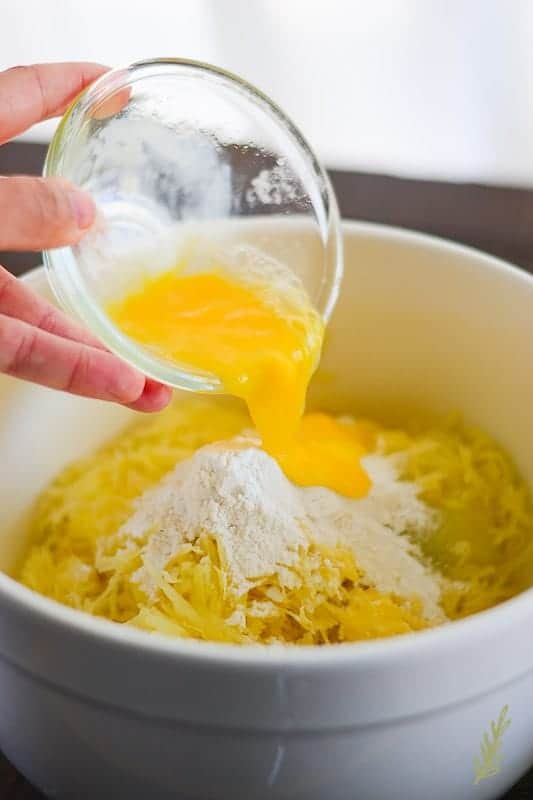 Meanwhile, in a large mixing bowl, combine the potatoes, onion, flour, salt, baking powder, and eggs. Mix well to combine. Scoop a 1/4 cup of the potatoes into the hot oil, carefully. Fry for 3-4 minutes, or until the sides turn a golden brown. Flip the latkes over and fry an additional 3-4 minutes. 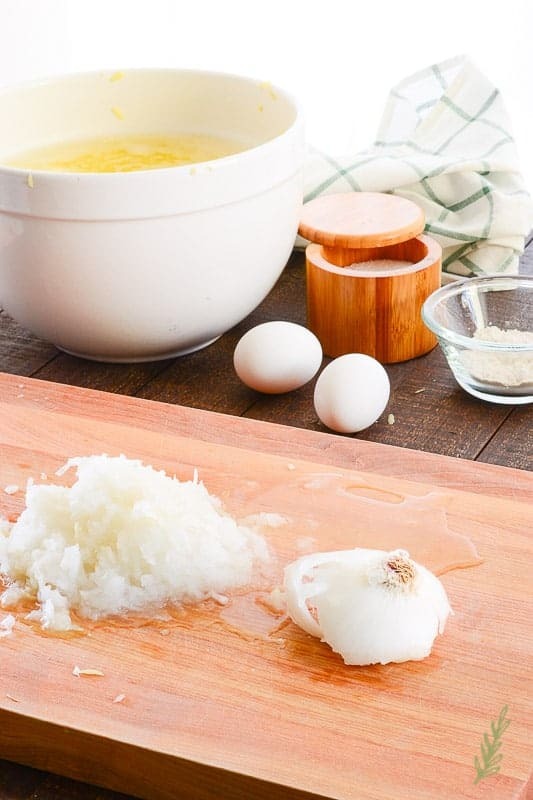 Remove the latkes from the oil using a slotted spoon and drain on a paper-towel lined dish. Continue frying until all the batter has been used. 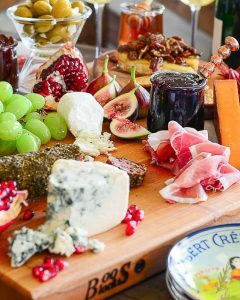 Top with your desired ingredients and enjoy immediately. ***THIS POST CONTAINS AFFILIATE LINKS. TO FIND OUT WHY THAT’S A THING, PLEASE READ MY DISCLOSURE PAGE. Ouch! Sit back and let everyone else wait hand and foot on you. Recipe looks delicious haven’t made these in a while. It’s SO hard to not do anything. I find I’m most creative when I CAN’T create…is that weird? Thanks a lot for the comment. Hopefully, you’ll love them as much as I do. How delicious! 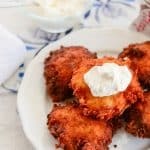 I’ve never had a potato pancake but I need to try it! For sure, Emily! I think you’ll really enjoy this puffy version. Oh potato pancakes. must make these this weekend! 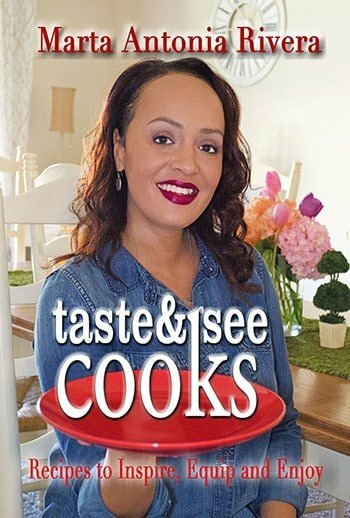 Thank you for this simple delicious recipe, can’t wait to eat!! You’re very welcome, Leah! I hope you enjoy them as much as we do! Thank you, Albert! Unfortunately, the doctor ordered another month in the splint. I’m really bummed about it. These look amazing. You know if you are Irish at all you can eat potatoes however you want. This was a fun read and I am sorry about your finger, I broke my toe last week and felt useless haha. Hope you heal up quick! 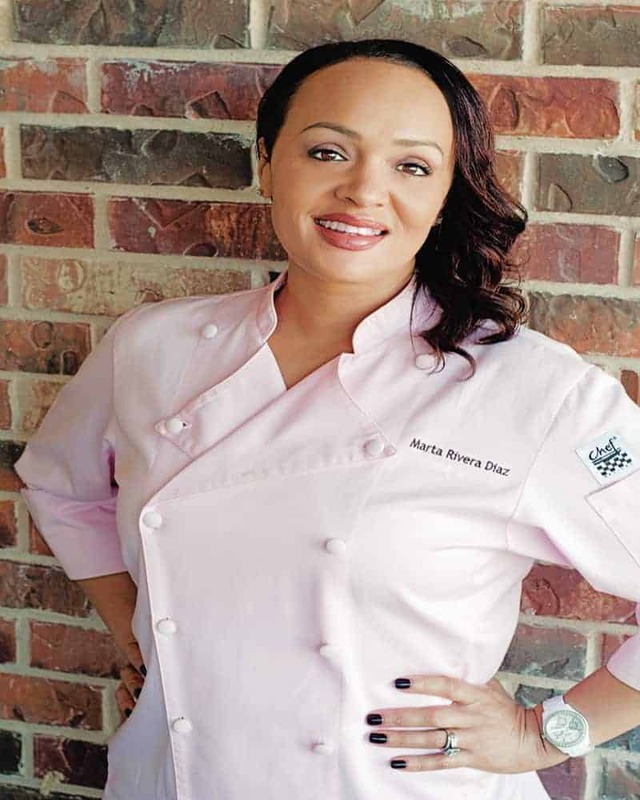 Well, then, call me Marta O’Rivera! I actually used to have an Irish last name, so who knows? But, yes, this finger business is making me miserable. They look so good! 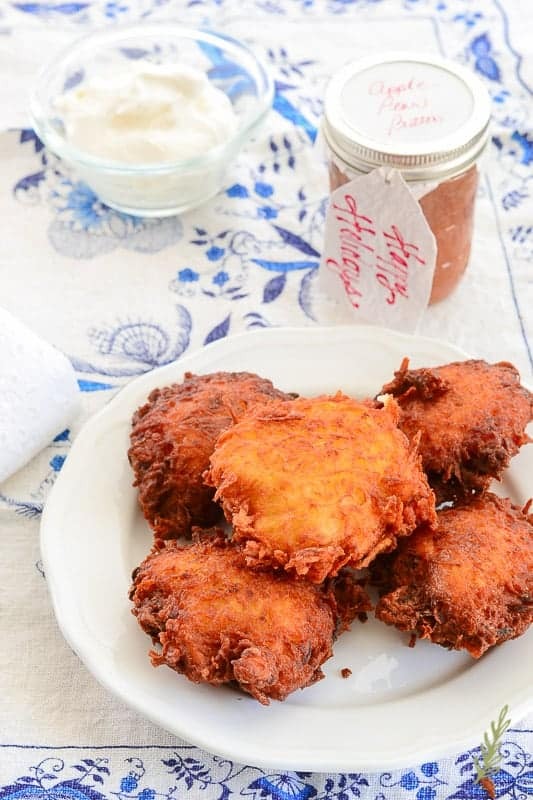 I’ve never made or tried potato pancakes but looks like something I’d love. Thanks, Cristina! I’m sure you’ll love them! 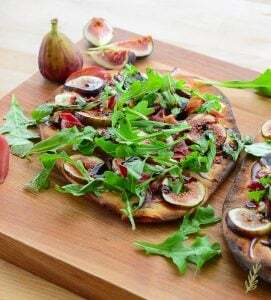 Totally simple to make and widely customizable as far as toppings go. My friend and I thank you. She has not had these since her grand die. Awww!! Well,it’s an honor to bring back a good memory. Enjoy them with all my affection! Potatoes are my favorite as well, Mimi! These ARE really simple to make, but worth every effort. These look amazing! In sure they taste even better! Also, your pictures are sooooo Good! Thank you so much, Yesenia! They taste WAY better than they look, LOL! It really is worth the effort, and it takes less time than driving to pick up take out! YUM! This looks amazing! Heading to the store for ingredients. OOOh!! Can I have some of yours too?! I loveeee potatoes and this looks so delicious! And I’m sorry about your finger! I broke my toe a few years ago and it was literally the most painful thing EVER! Right!? I feel like the splint is more painful than the break was though! Oh, you’re so lucky!! I love potatoes!